iiiiiii PROJECTS for the FUTURE !!!!!!! Welcome to the interactive developmental aspect of this site! This page is dedicated to the creation of community owned/ co-op style projects and enterprises. You will find a partial list of projects that I am offering up for collaboration. The descriptions revealed to you are brief and contains minimal descriptions for the reason of protecting the project from intellectual property theft, but upon reviewing your interests for creating societal change and your sincerity of intent, details will be revealed accordingly. In the mean time, consider me as the basis of the project. If you have checked out my site, my creations, and my aspirations as an individual... and you believe and trust in my visions and ideals, then that is the primary foundation for our collaboration. There are several ways that you can participate within being a part of a project and I welcome people from all sector and ways of life to participate. Whether you are a DESIGNER, BUILDER, ARTISAN, LAWYER, PROMOTER, ADMINISTRATOR, DRIVER, COMMUNICATOR, PERFORMER, DISTRIBUTOR, or PHILANTHROPIST ... whatever it may be... this is a place for you within society and therefore a place for you here... even if you are not certain what it may be yet. The key for our collaborative success is our believe in community equality, societal change, and the highest potential for every person on this planet to have a purpose. What is communal enterprise?... It is the active belief that the basic operations of any company we work for is the very "company" that we keep. The first basic cooperative there is is that of the family owned business. In the ideal of the family co-op, love is the basis for keeping it functioning. A second form of the co-op is that of friends with like interests and intents gathering together to create a common vision. A third form of communal enterprise is the inter-fusion of both the family and the friend cooperatives. It interlinks multiple families and friends working together to create a multi-faceted way of living where the business (masculine as in "brother business"), the social (feminine/ sister social), and the artistic (which is the duality of both male and female/ the inner child of creativity)... all form a perfectly equilateral triangle bridged together. Within the center of this triangle is a forth aspect which is the tools and the technology that unites the social, business, and creative. The strongest geometric building block is the triangle with all angles of the triangle equal... hence creating a self-supporting structure from which bridges are built (both literally and figuratively). Any other structure or shape of triangle without equal sides will collapse in time. That is what "communal enterprise" is... a return to our tribal roots and a way where families and friends are not divided by structures destined to fail because the needs, wants, and desires of the individuals are ignored... weakening the individual will. It is important to note that this statement is implying that corporations are evil... it is just illuminating the fact that the word "cooperation" came before "corporations". Often personal identity gets removed and it eliminates the creativity of the individuals within the "company" while the corporations sometimes suppress the very exchanges of social interactions within the work place that would evolve the company to new heights. Sometimes the solutions to the most complex problems lay within the simplest of places and people...if only they were allowed to speak their souls. So, what does being part of a communal project mean? Well, for starters it means that you are in a partnership with others in an equal accord. There are no requirement for attending pot lucks, or having to hang out after the work is done, or having to live together in a commune... but what it does mean is that you share a common passion that is of potency and is valued within the community decision making process. It means that you get an equal share in the company and its expansion and proceeds are divided equally for the equal value that you provided. Though there are project leaders, visionaries, and managers that unify the company, the concept of the CEO making all the decisions for the company while collecting the bulk of the income is not the structure of these collaborative communities. The initial formation of the company and the initial interviewing those who seems connected is part of the initial position that begins here. There are several functioning co-ops within San Francisco alone, which I would recommend you to investigate and I will provide links to some of those places in the near future... but for now, just think of it as forming a creative enterprise with others in which you will share equally in the benefits. These particular projects provided are formulated off my personal visions, but that is not to say that if you have a common vision, you can not be part of the project. I welcome evolution. this is an evolving list and subject to change and-or expansion. LIGHTING COOPERATIVE - light therapy and ambiance. In need of all sorts of positions. Specific details of master plan revealed after initial interviews. This enterprise is intended to create a line of various products that helps me to distribute my personal art to the general public in an affordable manner. 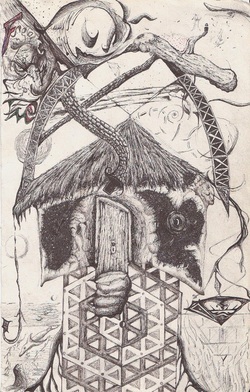 Each of the different types of products can be a co-op on there own... such being fashion and textiles line, prints and posters line, lighting and projections line, etc.. For starters though, I'm looking to create the initial communal board for putting together the various sects under one umbrella. ~Fashion Designers to put 2D images upon their fashions. ~Products developers for fine tuning and creating the inventory of goods. ~and other positions as well. Eventually once this enterprise has grown to a sustainable size, it will expand out to support other artisan networks of goods and services to be determined. ~All sorts of web and program designers. 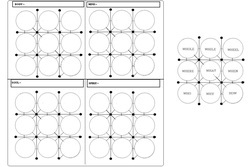 The image needs to be recreated from the static image into a moving image as well as geometrically accurate static image from which slices of each section can be made to create links from which the Information pertaining to it, can begin to be entered in. ~Providers for funding the beginning phases of the technological development and technologies necessary to the manifestation of the initial site. ~Copy write lawyers with vast knowledge of intellectual property rights, with intent for settlements for unauthorized use of replicated image. This project is a public relations site that is dedicated to being an automated co-op development site. It is to assist forming creative enterprises taking both existing communities and creating a networking sight for forming communities. 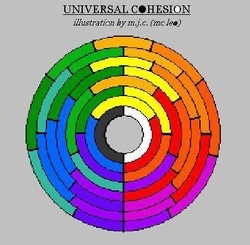 It needs all the positions mentioned above in the Universal Cohesion Wheel, but it serves more of an immediate purpose and needs immediate community support. Financiers are needed asap for acquired needed technologies as well as the programmers needed to manifest it, and if there is extra to pay for salaries for living expenses, that is of great need as well. This program will eventually manifest all other projects seen on this page, and many more other programs as well. I'm looking to put together a team of mixed arts and skills in the establishing of a community cafe in a semi-densely populated area of San Francisco (open to other locations to) where there is a need for such a community cafe without having to compete with other cafes. ~ A blank canvas to create and build an artist cooperative around visual arts and interior design. ~ An experimental community development space for bringing the local community together through interactive methods. ~ A way of expressing and patenting new experimental food and drink recipes that have been brewing for many years. The major needs would include an ideal venue with a blank slate for manifestation, Food and drink distributors that are support independent local communities, and Legal representatives who know about how to protect original culinary arts and all the necessary legal needs surrounding such an enterprise. Many other positions also needed.